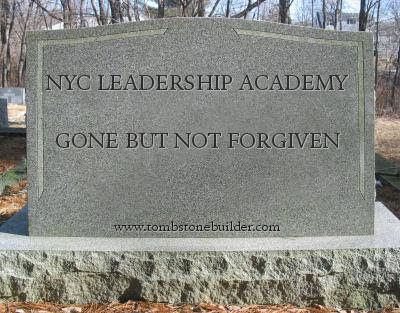 NYC Educator: Leadership Academy Is Dead. Long Live the Leadership Academy! Leadership Academy Is Dead. Long Live the Leadership Academy! I've spent quite a bit of the last year mystified as to why I needed to spend hours, days, months and perhaps years fighting blatant violations of the UFT Collective Bargaining Agreement. Given that we can no longer grieve letters to file, you'd think that the few exceptions we know about would be respected. For example, the CBA says incidents not reduced to writing within three months cannot be later placed in the file. I think my school has three grievances outstanding over that. There are others, but I'll spare you for now. Why does Mayor de Blasio hire a legal department that has no respect for the contract he's agreed to with teachers? Is he mad that UFT originally supported what's his name, the guy who told the Daily News editorial board that teachers didn't merit the same raise police officers and firefighters got? I mean, we did support de Blasio after what's his name lost. Personally, I supported de Blasio before what's his name lost, despite a series of phone calls urging me to do otherwise. He seemed like the perfect alternative to Bloomberg. He opposed charters, was going to slow them down, and won a pretty persuasive mandate. Of course, when he actually tried to stop charters, he learned that Andrew Cuomo was willing to push laws forcing the city to pay rent for charters it rejected. Maybe that's what changed. Now, certainly, there could be other factors. One might be his senior education policy advisor, Karin Goldmark. Who is this person? Well, she used to be the Vice President of the NYC Leadership Academy, And why shouldn't she be instrumental in training principals? I've read she has three years of teaching experience. She also seems to have worked for Tweed in some other capacity. So what if she's never been principal herself? You don't have to be a dog to read Call of the Wild. I was pretty surprised to learn this. It might explain why de Blasio has never cleaned house at Tweed. I mean, if his senior education policy worked there before he got there, is she gonna say, "Hey, I have a great idea. Why don't you fire me and everyone else who worked here for Michael Bloomberg?" Alas, it doesn't appear that idea crossed Ms. Goldmark's mind. We've all heard the horror stories about Leadership Academy principals who know everything despite having little or no experience. Goldmark seems to personify that. It's kind of remarkable that a senior education policy advisor can have as little (or less) school experience as Leadership Academy grads, some of the worst principals anyone's ever seen, but that's evidently good enough for Mayor Bill de Blasio. Is it good enough for new Chancellor Richard Carranza? I suppose it had better be, since he serves at the pleasure of the mayor. You can tell how smart Carranza is just by listening to him speak. He has a great memory and thinks on his feet. Yet he repeatedly says charters are public schools, and that's just not true. Charters are public in the sense that they take our money, and that's pretty much it. How many times do public school leaders bus children to Albany to push their agenda? How many public schools don't follow chancellor's regulations and therefore allow kids to pee themselves rather than take a test-prep break? How many public school leaders refuse to sign city agreements over pre-school? Eva Moskowitz does all of the above and more, and Carranza says she's running a public school. Hey, it's a pretty good deal to take public money and be answerable to no one. I really have no idea what role, if any, Karin Goldmark plays in any of that. But I was pretty shocked to learn that a former Leadership Academy big shot is advising Mayor de Blasio in education. It really explains the "meet the new boss, same as the old boss" feel so many of us have these days. Bloomberg's gone, but judging from teacher morale you'd hardly know that. Does Carranza want to change that? Will de Blasio let him? Is Karin Goldmark keeping all of Bloomberg's pawns in place even as de Blasio deludes himself that he's making a mark? Only time will tell, but de Blasio's had four years to leave an imprint on Tweed. Thus far, few if any teachers are feeling the difference.